Hoier S, Pfeifle C, von Merten S*, Linnenbrink M*. 2016. Communication at the Garden Fence - Context Dependent Vocalization in Female House Mice. PLoS ONE, 11(3). * von Merten and Linnenbrink contributed equally to this work. Zsebők S, Czabán D, Farkas J, Siemers BM, von Merten S. 2015. Acoustic Species Identification of Shrews: Twittering Calls for Monitoring. Ecological Informatics, 27 (2015): 1-10.
von Merten S, Hoier S, Pfeifle C, Tautz D. 2014. A Role for Ultrasonic Vocalisation in Social Communication and Divergence of Natural Populations of the House Mouse. PLoS ONE, 9(5). von Merten S & Siemers BM. 2012. 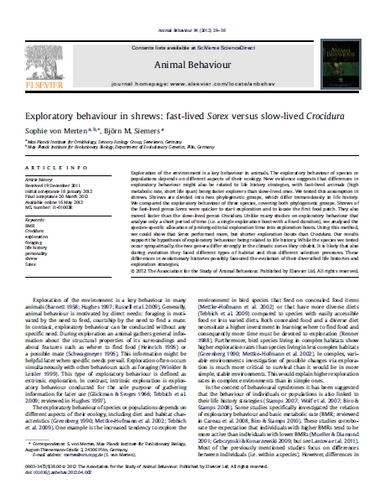 Exploratory behaviour in shrews: fast-lived Sorex versus slow-lived Crocidura. Animal Behaviour, 84, 29-38. Page RA*, von Merten S* & Siemers BM. 2012. Associative memory or algorithmic search: a comparative study on learning strategies of bats and shrews. Animal Cognition, 15, 495-504. * Page and von Merten contributed equally to this work. Siemers BM, Schauermann G, Turni H & von Merten S. 2009. Why do shrews twitter? Communication or simple echo-based orientation. Biology Letters, 5, 593-596. Winter Y, von Merten S, Kleindienst HU. 2005. Visual landmark orientation by flying bats at a large-scale touch and walk screen for bats, birds and rodents. Journal of Neuroscience Methods, 141, 283-290. ZEBinar Series - Adam Mickiewicz University Poznan, Poland 15.1.1014: The fast and the furious? Personality differences in European shrew species. 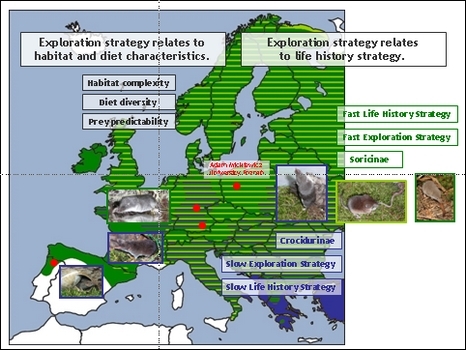 Animal Ecology Seminar - University Potsdam, Germany 4.6.1013: Do Exploration and Learning Strategies relate to Life History Strategies? Studies on shrews and bats. Workshop Theoretical Biology - MPI for Evolutionary Biology, Plön, Germany 8.3.1013: Ultrasonic Vocalisation Behaviour of Wild House Mice: A basis for mate choice? Ecology Seminar - University of Ulm, Germany 8.6.2010: Why do shrews twitter - Vocal communication or echo-based orientation?